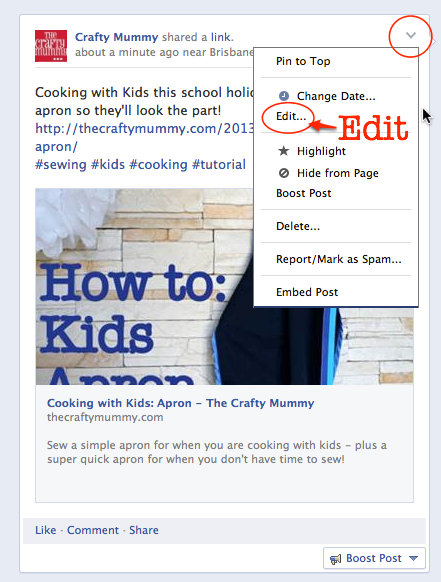 Facebook has just added the ability to edit your Page posts. I love this! I won’t tell you how many times I have created an update and realised an hour or two later that it had a typo! Now you can fix that. Plus Facebook will show readers if you have edited your post so that they can see what has changed. Hover in the top right corner of the post until an arrow appears. Click the arrow to see the drop down menu. Choose Edit from the list. A box will appear around the text and you can click in the box to change your text. When you’re done, click the “Done Editing” button. If you shared a photo on your Page, you can still edit the comment on that by clicking on the photo and then choosing the Edit option just under the comment. Do you like this new Facebook feature? Will you use it?